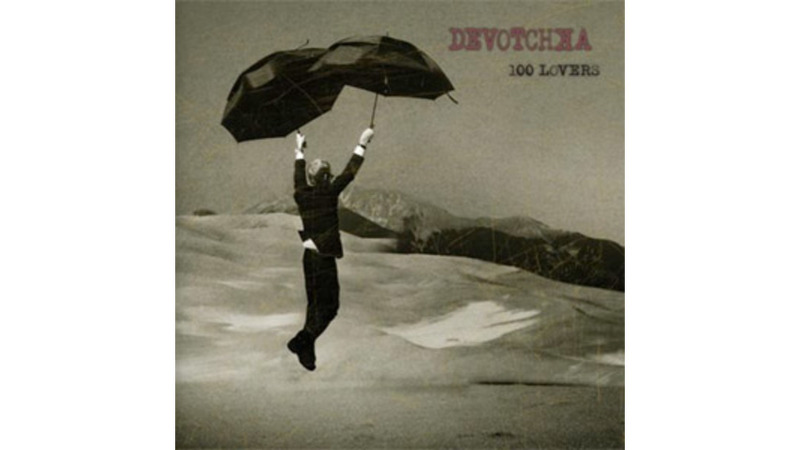 DeVotchKa’s fifth studio LP, 100 Lovers, begins with a gorgeously moody and cinematic wash of synths, strings and piano seeping forth as if water through a crack in a dam. From beneath this swirl of sound, a steady-marching drumbeat subtly emerges, pressure building slowly at first but then more and more rapidly until, finally, the wall holding back the floodwaters bursts in a majestic symphonic crescendo, singer Nick Urata’s lovelorn slow-motion wail tumbling head over heels in the resulting torrent. The feeling this intro evokes perfectly sets the tone for the album’s first seven songs, on which DeVotchKa trades a bit of its international flavor for a sound more akin to glossy, modern New York indie pop a la Animal Collective or The Walkmen (excepting the accordion hook in “The Man from San Sebastian”). It’s a move that the band and producer/engineer Craig Schumacher (Calexico, Ladybug Transistor) execute extremely well, and a sound DeVotchKa has flirted with a few times in the past, most notably on the title track to 2004’s How It Ends (also produced by Schumacher) and “Transliterator,” from 2008’s A Mad and Faithful Telling. Before any diehard fans get jittery, the second half of the record—as if its own distinct vinyl side—is vintage DeVotchKa. “Bad Luck Heels” is a driving 6/8 ballad complete with urgently strummed Spanish guitar and velvety mariachi horns. And the accordion returns prominently on “Ruthless” and “Contrabanda,” adding an unmistakeable gypsy-rock vibe. In what very well could be a transitional album for an evolving band, Urata’s achingly expressive voice is the unbreakable thread keeping these two somewhat disparate mini albums safely tethered. His approach is reminiscent of a young Michael Stipe, in that his vocals are buried, just another instrument in the mix. Because of this—and his beautifully lazy enunciation—it’s extremely difficult to discern what he’s singing about, though the emotion comes through loud and clear. As with IRS-era R.E.M., Urata’s occasionally decipherable moaned fragments—“sinking ships” and “fingertips,” “flying conditions” and “overseas transmissions”—only add to the music’s murky mystery, making 100 Lovers an intriguing listen, even if it suffers from a mild case of dissociative identity disorder.